Creek and Cella serves up only the best Australia has to offer. From artisan cheeses to biodynamic wines to local microbrews, this new gem is a must try. This bar and brunch spot is the newest creation from the team behind such redoubtable Sydney haunts as Bitter Phew and Doris and Beryl's Bridge Club and Tea House. Creek and Cella is their newest creation and their first foray into gastronomy. We joined them as they unveiled their new brunch menu and were bowled over by the flavours and the service. Nestled in a row of buildings across near Leichhardt's Norton Plaza, it would be easily missable, save for the warm and cozy glow emanating from the vintage Edison bulbs suspended from the ceiling. Jazzy standards blend with Franz Ferdinand to create an upbeat but intimate backdrop for customers nestled into leather couches or noshing at wooden-planked tables. Creek and Cella sticks out by offering a trendy alternative to the Italian restaurants and pizza joints on Norton. Although simple, attention has been made to the details. And this applies to the food as well as the atmosphere. Two large coolers, one of cheese and one of charcuteries, line the wall and boast a wide range of epicurean delights. On tap, are an ever expanding number of craft beers, some exclusively sourced through relationships the creators have made over time. The cocktails are inspired and the bartender aims to please, crafting me up a dry Rob Roy (though not on the menu) and garnishing it with a brandy-infused cherry. OMG, Yum. 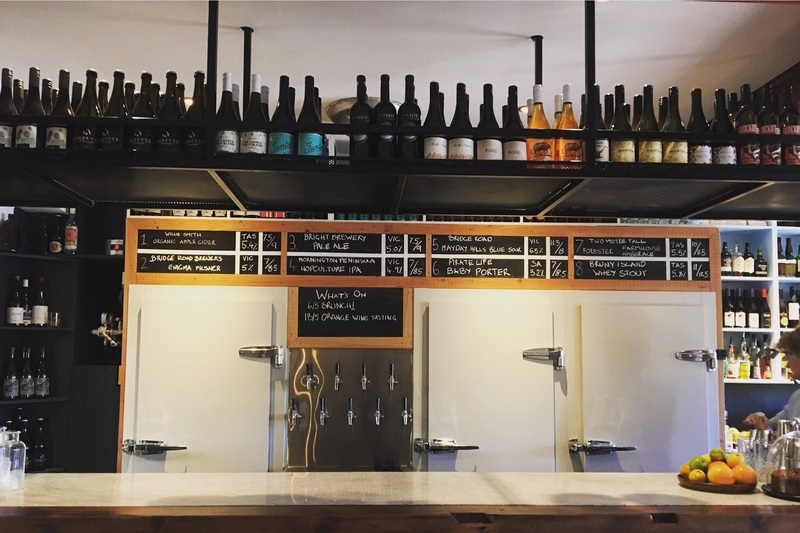 Actually, it was the strength of these local connections with Australian producers that inspired the owners to expand from brews to food, and create Creek and Cella. The aim is to feature Australian-crafted ingredients in simple preparations. This concept really shows in Creek and Cella's newly launched brunch menu. Old standards showcase the quality ingredients, like the 5 cheese toastie that features Australian cheeses and field mushrooms. Or a breakfast bowl where the optional salmon upgrade is highly recommended - it comes from friends who smoke it in the Snowy Mountains. The menu also features a blend of re-inspired dishes– like a breakfast affogato with cornflakes and a carbonara with crispy guanciale instead of bacon. (Doesn't pasta sound like the perfect hangover cure? Why have I never thought of that!) At night, the cheese plates, sliced meats and tapas-style dishes will change with the seasons. This is one of the best meal experiences we've had in 2017. Try this new restaurant now before it becomes impossible to get a table - they take bookings for events in the back room - tell them the Patrician and Plebe sent you! Nothing beats a great cheese plate in a lovely new eatery!